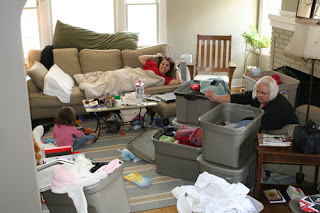 This is my first day home from the hospital,and I am surrounded by complete and utter chaos. My mom is here this week helping me organize and purge ALL of Holland's old baby clothes, toys, and equipment. I am very excited about the end results, but the whole process is pretty painful. One of the problems is that even when I have a huge project like this one I maintain cleanliness and a sense of organization through out the whole deal. Well, as you can see there isn't anything clean or organized about what's going on in my living room. The irony of it all is that I had someone come in and professionally clean our house yesterday (a welcome home present to myself)! I also had my hubby go through and "de-clutter" all that he and Holland had cluttered over the last 7 weeks. I'm not real sure why I am even posting about this. I was feeling so "out of control" ealier so much that I even asked to be taken back to the hospital! A few hours have since passed and I am feeling much better now. I am actually feeling quite grateful. Grateful to be home. Grateful for my mom. Grateful for all of her hard work. Grateful for my husband who is starting to clean out the soon-to-be-baby room. Grateful for my daughter who eagerly explores all of her old baby stuff and is so enthusiastic about sharing it with her baby sister. Grateful for a home cooked meal. Grateful for the sunshine beaming through my big picture window. Grateful for matching bins. Grateful for what's now a clean floor. And I am greatful to have you as a friend Ashley! Congrats on being home. Although I really wish you would have waited just a few more weeks to purge any of H's old clothes as who knows we might just have a little girly, haha most likely not but you never know. Enjoy it chica! So glad you're home, Ashley! I can't imagine what I'd come home to if I were gone for 7 weeks. I shudder to think...! YIPEE! YEA! YOO HOO! CONGRATS Ashley! I'm about a week behind in your blog, but am so excited about your parole!! It must be such an amazing feeling (even with a teeny, tiny bit of clutter at your house). Holland sure looks like she is having fun! Did you have to give up your super cool wheels? If so, it was probably worth it just to have your great window view at home! Enjoy the sun! ok, just reading back through the comments wanted to add that I am grateful that you share sooo many great ideas with the world. I have started a little journal of Koren's recent sayings! I'll have to share with you soon. Grab a plastic patio chair in your shower if you have one. It made my showers mush easier. Glad you are doing well!!! P.S. Holland is gorgeous in her ballet clothes! !